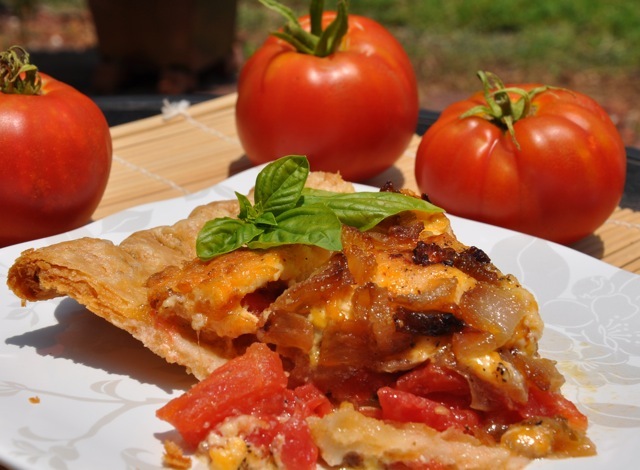 I love fresh tomato pie. The fact that there’s about as much agreement on the correct way to make it, as there is on which of the sixteen (and counting) Republican presidential hopefuls is best qualified for the job, doesn’t bother me in the least. Nor should it bother you. I’ve been experimenting with tomato pies this week – as a prelude to the 4th – with the goal of achieving a crowd pleasing, can’t-miss Independence Day pie. I’ve come up with a winner, and I think you’ll be pleased. There are many points of contention swirling around tomato pie, among them the handling of its marquee ingredient. Should the tomato skins be removed or left on? 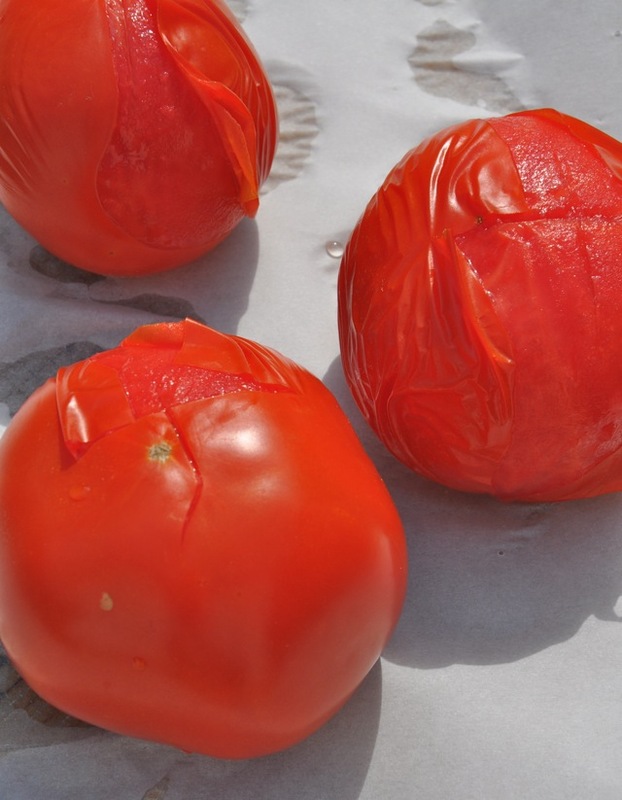 Is it better to slice the tomatoes thickly, thinly, or cut them into chunks? Leave them juicy, or get the juice out? And that’s just the tomatoes. It all depends on the pie, but this time we’ll take skins off. Cooked tomato skins have a way of curling up into papery-chewy wads that almost nobody finds charming, even after a couple of July 4th margaritas. So off they go. The simplest way to remove the skins is to first make a very shallow X in the skin with a serrated knife. Then – using tongs – lower the tomatoes, one or two at a time, into a large saucepan of boiling water. Wait about 15 or 20 seconds, then remove the tomatoes and set them aside in a large bowl. Cool for several minutes, at which point the skins will look loose and shriveling like they do in the photo above. Slip off the skins. Now core the tomatoes, halve them crosswise and squeeze the seeds and “jelly” out of each half. 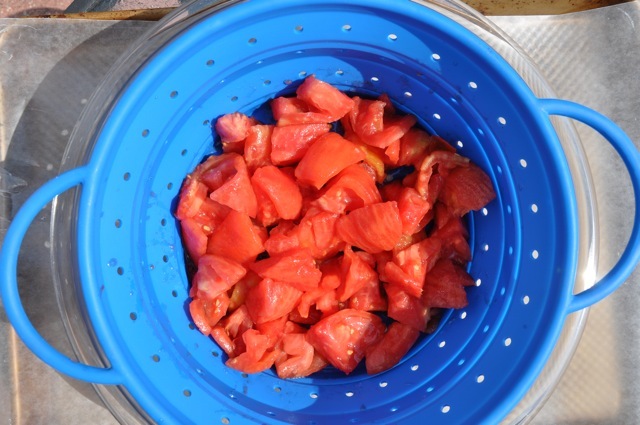 Cut the tomato halves into good size chunks, place them in a colander, and salt well. Let drain for 30 to 60 minutes, to remove much of the juice. Note that you’re not trying to get the tomatoes bone dry; a little juice is fine. But removing excess moisture will help prevent your filling from becoming soupy, not an uncommon complaint in the annals of tomato pie literature. One hedge we deploy against an overly moist filling is Italian style bread crumbs, to sponge up some of the juice. We scatter a tablespoon in the shell and half as much on top of the tomatoes, which should do the trick. I’ve also used cornmeal, but I like the way Italian style breadcrumbs add a little extra flavor. It’s best to pile everything into a partially prebaked pie shell. 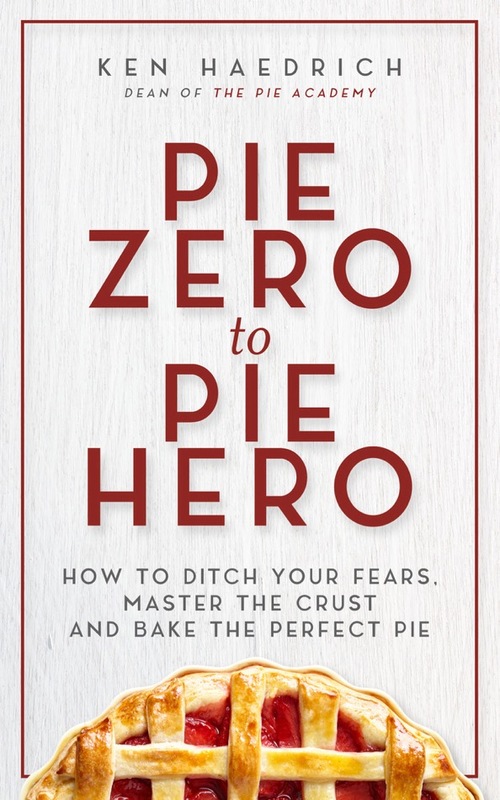 Prebaking the crust involves an extra step that you probably don’t relish, but your steadfastness will be rewarded. Prebaking often means the difference between a soggy crust, and a sensational one. You’re building nothing short of a summertime masterpiece here, something people will talk about in superlatives for years to come. Taking a shortcut is not in your best interest, nor that of your guests. 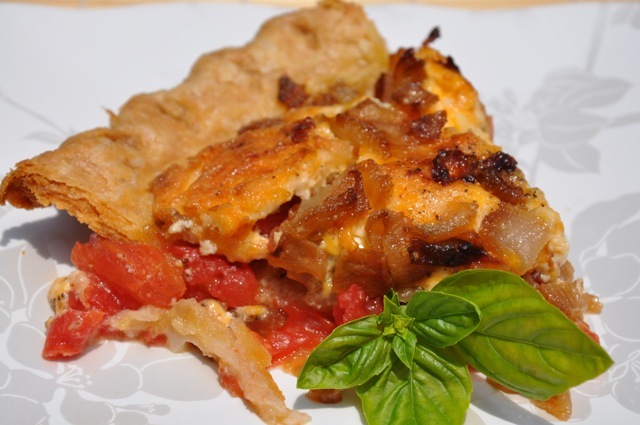 A layer of caramelized onions goes over the tomatoes, followed by dollops of pesto or chopped fresh basil. (I say OR, but my extreme preference is the pesto.) 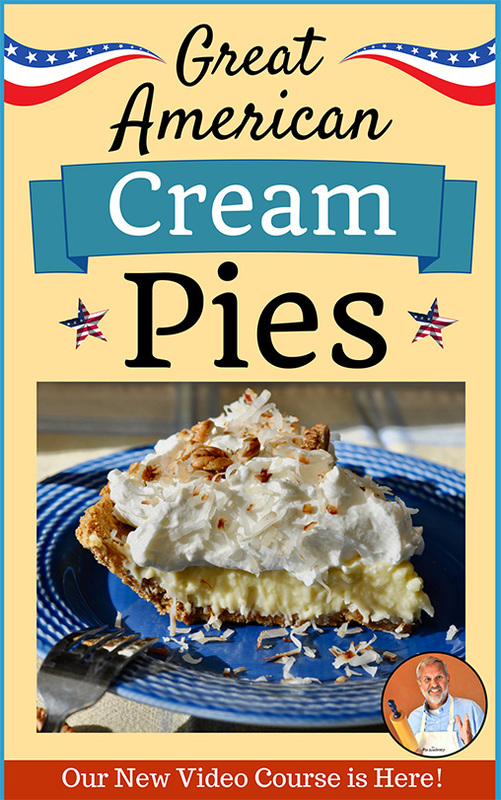 A rich mayo-and-cheese topping is scattered over the filling. You bake the whole production until it’s a deep golden brown, bubblyish, and just plain irresistibly yummy looking. Cool long enough for the filling to firm up a bit – 30 to 60 minutes – then dig in. I’ll confess to adding a generous coating of crumbled, crisp-cooked bacon on top of the tomatoes on more than one occasion. It’s an upgrade worthy of your serious consideration. Even though this is a moist pie, it does firm up as it sits and it’s great the next day if you refrigerate the leftovers. Reheat it right in the pan in a low oven. You can also reheat slices in the microwave, though I’m generally not a fan of nuking any sort of pie. 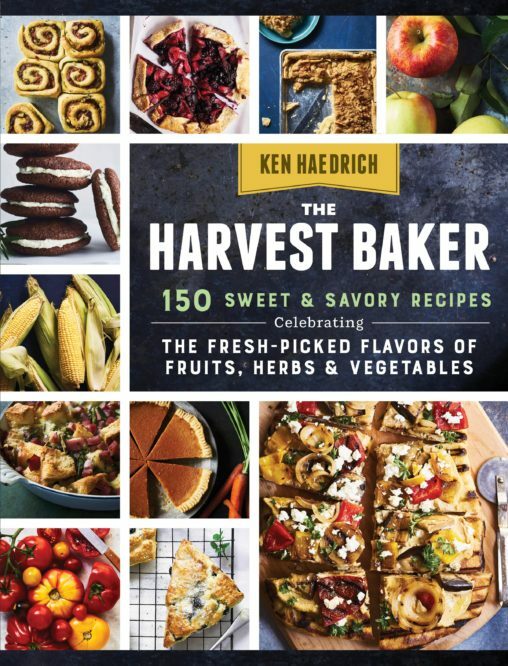 They’ll be a host of traditional favorites at your July 4th gatherings, you can be sure of that. But we can always find some space, amidst the hot dogs, burgers and sides to share some new favorites. I say make a little room for tomato pie. 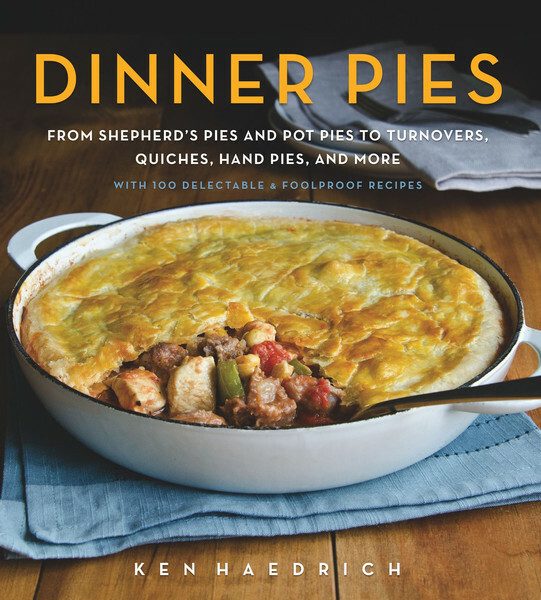 PASTRY NOTES: Use your favorite pastry recipe for this pie; I like the GOOD BASIC PIE DOUGH or the FOOD PROCESSOR PIE DOUGH. If you haven't already, prepare the pastry, then wrap and refrigerate for at least 2 hours before rolling. On a sheet of lightly floured wax paper, roll the dough into a 13-inch circle. Invert the pastry over a 9- or 9 1/2-inch deep-dish pie pan, center it, then peel off the paper. Gently tuck the pastry into the pan without stretching it. Sculpt the overhanging dough into an upstanding ridge. Flute if desired, then refrigerate for at least 1 hour. Preheat the oven to 375°. Prick the bottom of the pie shell 6 or 7 times with a fork. Tear off a sheet of aluminum foil about 16 inches long. Carefully - so you don't displace the shell - line the pie shell with the foil, pressing it into the creases so it fits like a glove. Add a thick layer of dried beans, banking them up the sides. Meanwhile, melt the butter in a large skillet. Add the onions and cook them slowly, for about 20 minutes, until caramelized, stirring often. Remove from the heat and set aside. Combine the mayo, cheeses, and pepper in a bowl; mix gently, to combine. Set aside. When you're ready to assemble the pie, preheat the oven to 375°. 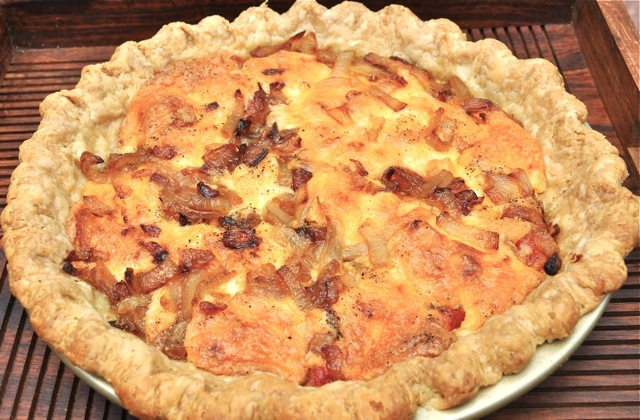 Sprinkle 1 tablespoon of the bread crumbs evenly in the pie shell. 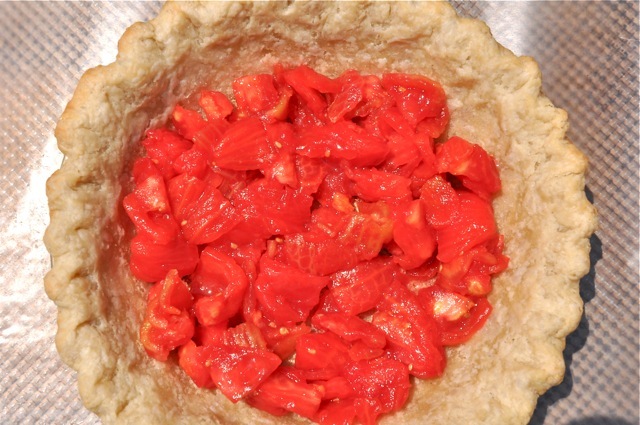 Lift the tomatoes out of the colander and arrange them in an even layer in the pie shell; salt to taste. Sprinkle with the remaining half tablespoon of bread crumbs. Scatter half of the onions over the tomatoes, then dot the filling with the pesto or sprinkle with the fresh basil. Spoon the cheese mixture here and there over the tomatoes, then scatter the remaining onions in between the cheese mixture. Bake the pie on the center oven rack for 30 minutes, then reduce the heat to 350° and bake another 15 to 20 minutes, until the top is a rich golden brown. Transfer the pie to a cooling rack and cool for at least 30 minutes before serving. Makes 8 to 10 servings.